This video will guide you through the appropriate process of reconstituting ABRAXANE. 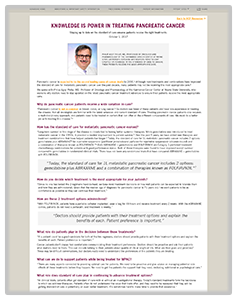 Download the Prescribing Information for ABRAXANE. Explore the characteristics of advanced squamous NSCLC and its clinical manifestations. A novel, 360-degree virtual reality experience that transports you inside the lung to understand the characteristics of advanced squamous NSCLC and its clinical manifestations from a new perspective. Set up a presentation in your office today. Dr. George Kim reviews the MPACT study–the largest multinational Phase III study in metastatic pancreatic cancer (MPAC) using ABRAXANE + gemcitabine in the first-line setting. Dr. Kim presents the study design and results in the MPACT study. Dr. Kim presents the efficacy results for ABRAXANE in the MPACT study (including OS, ORR, and PFS). Dr. Kim presents the safety results for ABRAXANE in the MPACT study. Dr. Kim presents dosing and schedule recommendations for ABRAXANE in the MPACT study. Discover why Philip Agop Philip, MD, professor of oncology and pharmacology at the Karmanos Cancer Center, believes doctors staying up-to-date on the standard of care is essential to ensuring MPAC patients receive the most appropriate treatments. Results from the Phase III Study: ABRAXANE plus gemcitabine for MPAC. Dosing Instructions for ABRAXANE MPAC indication including starting dose/schedule and dose modifications for certain treatment-related adverse reactions. Learn about ABRAXANE + gemcitabine’s NCCN Category 1 recommendation in metastatic pancreatic cancer patients with good performance status (ECOG 0-1) and as a reasonable option for patients with KPS 70.